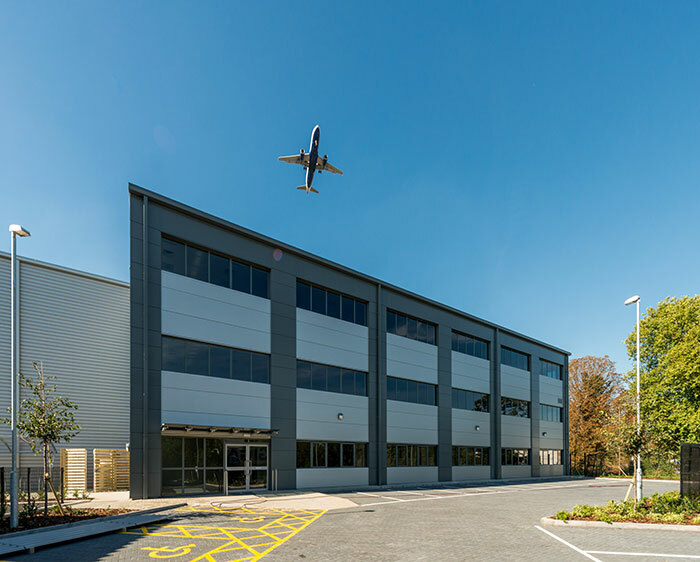 R105 Facilities Building, Oxfordshire | Butler & Young Group Ltd. The R105 Facilities Support Building (FSB) enables world-leading research at the Rutherford Appleton Laboratory near Oxford. As well as being set into the adjoining earth mound to reduce it’s visual impact, the buildings curved roof compliments the surrounding beauty of the area. The building delivers 70 x 35m of flexible clear-span usable floor space for each facility, both served by full overhead crane coverage. Vehicular service access is provided to each end of both facilities, whilst three storey offices for 80 people sit above the Test facility on the north elevation. Working closely with the design team helped this project achieve BREEAM ‘Very Good’ standard. Navigating around the challenge, to make enough internal space available to meet the job requirements whilst keeping the visual impact in the surrounding countryside low, was an interesting task but a successful one. The clients brief to have a facility to handle both testing and handling was met to a high standard without compromising on useability and safety.